Amy Cunningham believes that as baby boomers die in increasing numbers, the environmentally friendly approach to funerals will become even more popular. NEW YORK – First there was Slow Food. Now come slow funerals. Unlike the pricey organic produce at Whole Foods, back-to-basics funerals are usually cheaper than conventional ones. Cunningham said that a cremation in Brooklyn could cost less than $2,000, and her blog, The Inspired Funeral, lists 14 green cemeteries outside the city that charge less than those within it. 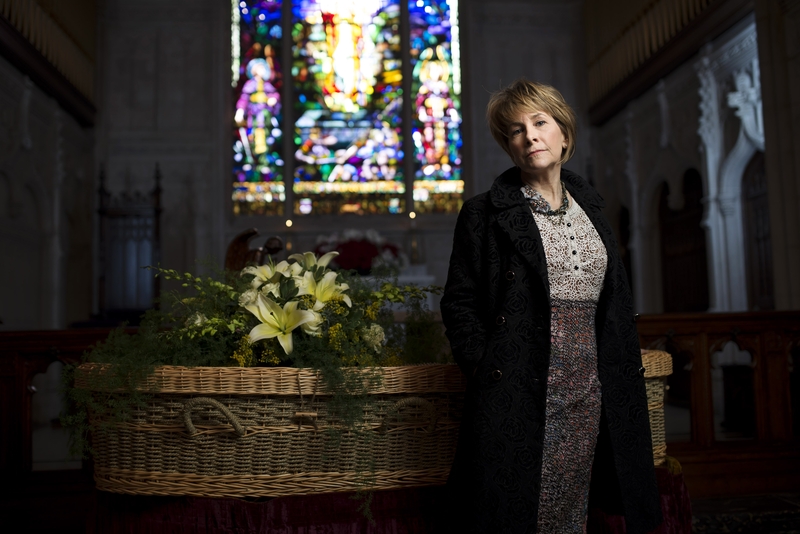 The Green Burial Council estimates that one-quarter of older Americans want a green burial, and Cunningham said that about the same proportion of her clients make that choice. Beyond the East River, too, the funeral industry is responding to a widespread desire for greener and more meaningful send-offs. In Sebastopol, Calif., Jerrigrace Lyons advocates home funerals and encourages families to spend more time with the body. Nature’s Casket, outside Boulder, Colo., makes rustic, handmade pine coffins that can be used premortem as bookshelves. Eternal Reefs, near Atlanta, helps clients turn cremated remains into personalized, eco-friendly “reef balls,” which are placed on the ocean floor, aiding the growth of coral reefs. When Cunningham’s father died in Orangeburg, S.C., five years ago, she and her two siblings arranged what she called “the most glorious memorial service,” culminating with a jubilant farewell from a jazz band. “I came back to Brooklyn,” she said, “obviously quite miserable that my 94-year-old father was dead but elated at what we had built as a family.” When she suggested to her husband that she might want to turn this experience into her next vocation, he didn’t laugh. Many of Greenwood’s clients are Catholic, but they are increasingly from diverse religions and backgrounds. Once, Cunningham helped arrange a Hindu service that involved figs, rice and ghee. As New York is a place with many transplants who have drifted from their native customs, she sometimes reintroduces them to their pasts and other times helps them invent new, personal rites, often involving music and the participation of children. On her blog, she writes about sacred music, hard truths about cremation, wicker caskets (“To die for!”) and the achingly sweet Irving Berlin tune sung at the funeral of Peter Kaplan, longtime editor of The New York Observer. She has posted Lee Strasberg’s anguished eulogy to Marilyn Monroe and Cher’s to Sonny Bono. “I’m using my blog as a way to continue my life as a journalist,” she said. When the title “funeral director” popped up on Cunningham’s LinkedIn profile, she said many of her connections were shocked, but then they weren’t. “I thought, Amy’s a very spiritual person, so that sounds great, actually,” said Lama Surya Das, a Brooklyn-born Buddhist leader who wrote a column that Cunningham edited for Beliefnet.com, the website founded and later sold by Waldman (and where this reporter worked for eight months during its startup). Now she deploys those skills with her clients. When Ada Di Scipio, a retired school administrator from Brooklyn, was planning the funeral of her ex-husband, who had remained her best friend, she said: “Amy took the time to research him. She went online, she Googled him, she found out about his background.” Cunningham also made house calls. “She gave us her home phone number, her cell number,” Di Scipio said. At some funerals, especially for the young, the grief is too raw to allow for uplift. “Sometimes it’s just a tragedy,” Cunningham said. Succumbing to the pain of clients is an occupational hazard. Sitting in the utterly silent crematory at the Gothic-gated Green-Wood Cemetery, a block away from the funeral home, Cunningham says that her family helps keep her sane and that she finds her work more rewarding than depressing. She deals with people when they’re feeling their worst but acting their best.